Cherry Blossom and Pear Trees Think It’s Spring! Bit of a stormy day today. Rained pretty hard this morning and we are under a tornado watch until 5:00 p.m. Of course, with these wonderful weather conditions, the generators were off this morning! They did turn them on at noon and we now have two units generating 6440 cfs of water with Taneycomo tailwater level at 706.6 This is only the second time in eight days that we have seen a no generators. Starting to see lots of cherry blossoms and pear trees in bloom, along with the spring flowers. I hope it is a sign that Spring weather (excluding all the rain) is right around the corner! After we get through today, the next chance for rain looks like next Tuesday. Temperatures are cooling down a little into the low 60s through the middle of next week then back into the 70s. That one other day we had a window of no generators was this past Monday. 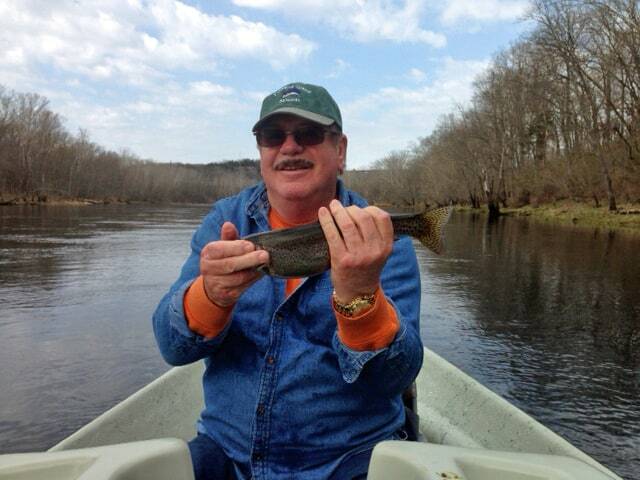 Dana got on the water early with his fishers, Bob and Bill from Texas. Started out to be another great day on the water until the water came on around 10:00 a.m. Up to then, they were have a wonderful fish day on the blue poison, copper dun and rusty midges. Darrell got on the water around 9:00 a.m. with his folks from Vermont, Bill and Dee. Off to a good start for them too on the black copperhead midge and the ruby midge. Stan hit the water a little later and had just rowed Mike, up river a little ways and three horns blew. It took a matter of minutes and the river turned to a murky river with lots of junk in it. Stan did and about face and came off the river. Mike’s trip to be taken another day when the conditions are good. Darrell and his fishers caught a couple more fish as they were little ahead of the water, but it was off early for them. Dana’s guys tried for a little while longer; had lunch and came in. Life in a tailwater! with Carolyn These two are engaged and I think Bill, who is an avid fly fisher, is hoping to get Chong into fly fishing With a little work on the roll cast, some mending work and line handling, Chong was bringing in trout. 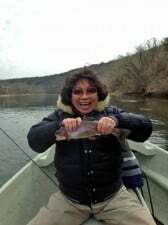 Of course, she had to catch the largest fish. They had a good day on the black copper-head midge under the big ruby, or a lightning bug. Bill and Bea, from Kansas City were out with Stan. They had a wonderful time and day catching fish on the lightning bug and the black midge. They loved the Havarti cheese and chocolate chip cookies too! Jim had Erik and his son, Brian out all day. Brian is fairly new to fly fishing so they worked on technique and caught fish on the ruby midge, black zebra midge and stripping the holographic green crackleback. Another good day Tuesday. Maybe not quite as good as the day before, but still a very good day. Peter, from Kansas, spent half a day on the water with Carolyn. Started out the morning catching fish on a size 16 blue poison dropped from the big ruby. Found some quieter water and finished up the trip with either the size 16 red midge or black midge under the size 16 lightning bug. Had a few hits on a red soft hackle and pulled a couple with the CQ streamer. Meanwhile, Stan and Jim had Mac and his friend John and their two sons, Hugo and Jonathan, out for half a day. Jim, being the grandfather figure he is, took the two boys, and Stan took Mac and John. The boys caught fish drifting the big ruby with a black midge dropper and Jim helped them out throwing the size 12 CQ streamer. Stan’s guys were catching most of their fish on the lightning bug. This entry was posted on Thursday, April 3rd, 2014 at 3:01 pm	and is filed under Fishing Reports. You can follow any responses to this entry through the RSS 2.0 feed. You can leave a response, or trackback from your own site.